Some SANGLAS Motorcycle Manuals & Wiring Diagrams are above the page. Sanglas is a motorcycle of the Spanish manufacturer, which was founded in Barcelona (Poble Nou) in 1942 and ceased production in 1981. Motorcycles Sanglas were with relatively powerful engines for their time, especially for Spain. The company was born with the goal of positioning itself as an alternative to such brands as BMW, Zündapp or DKW (Manuals pages) for providing motorcycles with official bodies. 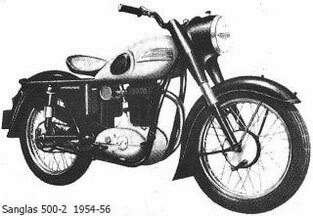 The history of the brand began in 1942, three years after the Spanish Civil War, but the first documents on the formal sales of motorcycles date back to 1947. The company was founded by two young engineering students in Barcelone, the brothers Javier and Martin Sanglas with the financing of their father, an entrepreneur in the textile industry. The Sanglas models were hybrids of English and German models. The chassis was based on the concept of BMW and the engine, such as a monoblock, a 4-stroke single cylinder, OHV type, whose design was inspired by the DKW brand. The first motorcycle was with an engine capacity of 347.75 cc. and a power of 14.4 hp. at 4800 rpm. At the end of 1948 the company already had 100 employees, and 200 units were manufactured. 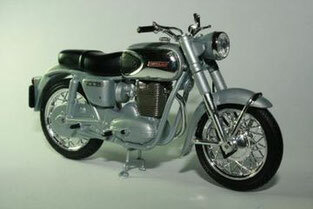 The first model with 500 cc engine was launched in October 1952. In 1976, the model 500S (Sanglas concept) with disc brakes and a power of 32 hp was introduced. at 6700 rpm. At the same time, the 400E model was strengthened to become 400F. The 500S model is successfully sold abroad with the financial support of Prodinsa, which also owned the shares of Mototrans (a manufacturer licensed by the motorcycle Italian brand Ducati (Manuals page)). In 1977, the production of 500 S2 was launched, and two years later a version with a five-speed transmission (500-S2 V5) appeared on the market. Business would never become a profitable investment company Prodinsa and the Sanglas brand is sold to the Spanish bank Banesto with the idea of achieving capital gains from the sale of the company to some Japanese manufacturers who are looking for a local partner to penetrate the Spanish market. Finally, in 1981, SEMSA was established with the participation of Yamaha (PDF Manuals page), Banesto, the Bank of Madrid and the Catalan Development Bank. 50% of the capital was initially in the hands of Yamaha and after some increase in capital, it reached full control of the company. The last Sanglas with its own engine, 500 S2 V5, came off the assembly line in 1981. Production of the 400Y ceased in 1982 and thus the name Sanglas disappeared. From this moment, motorcycles will be produced only under the Yamaha brand. In 1989, SEMSA disappears and remains Yamaha engine Spain, S.A.